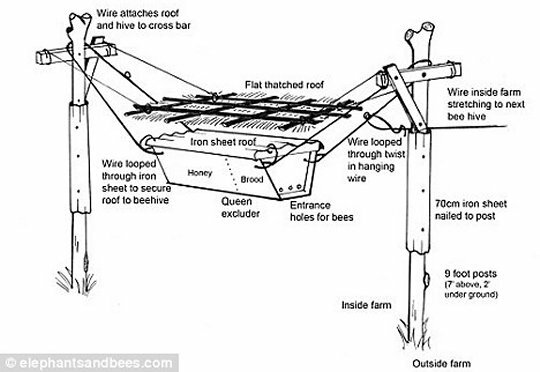 Elephants and African farmers have had a long history of conflict, but now Lucy King’s work is helping to bring an end to it, using beehive “fences” that keep elephants out of farmers’ fields. It might seem that Elephants aren’t scared of much. Like Lions, they seem to rule their land. However, what they don’t like are bees and they don’t enjoy getting stung inside of their trunks. It makes sense that this is where they would be most vulnerable. The large animals will even flee when they hear bees buzzing around them. It makes sense that this is where they would be most vulnerable. The large animals will even flee when they hear bees buzzing around them. Dr King and her team in Kenya proved that over 90% of elephants will run away when they hear the sounds of buzzing bees. They also discovered that Elephants will even warn others nearby about the presence of bees using a special rumble. Constructing barriers where beehives are built into a fence, they were successfully able to keep the elephants away from the farmers. She has solved an age old problem that will allow farmers to prosper with very little to no extra investment. In Africa that is a big deal. 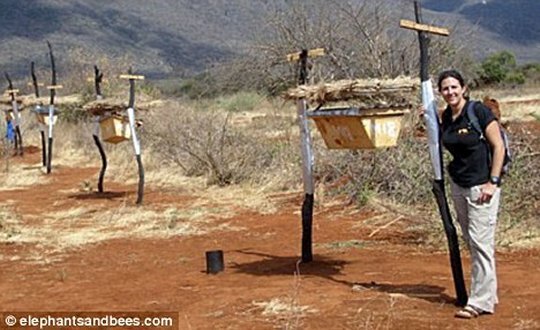 Fences that have already gone up in three Kenyan districts have proven their worth as the farmers have increased their profits from selling honey. Best of all, Elephants don’t end up being killed. This story is proof once again that often the simplest solutions are the most effective. 2 Comments on "Using Bees To Ease Tensions Between People And Elephants"
Yet I wonder how many folks will end up dead from bee stings? Probably none. Bee sting death’s are rare and usually happen because the person accidentally stumbled into a hive that they did not see and then did not know the proper way to deal with it (which would be to flee from the area where the hive is and continue to do move away until the bees are not chasing you anymore). These hives are quite visible. Honey bees are not out to sting and attack people just for the fun of it. They only sting for 2 reasons. 1) In defense of their home. 2) By accident (like if one becomes entangled in your hair).